Could 341mph be just the tip of the iceberg for Ohio State University’s land speed record-holding EV streamliner, the Venturi Buckeye Bullet 3? Formula Student racing cars (also known Formula SAE) have become a hugely popular way for students to hone their automotive engineering skills before graduating to work at car makers, race teams or other specialist companies. Ohio State University (OSU) in the American Midwest is home to one such team. But OSU students have also built something much, much faster. 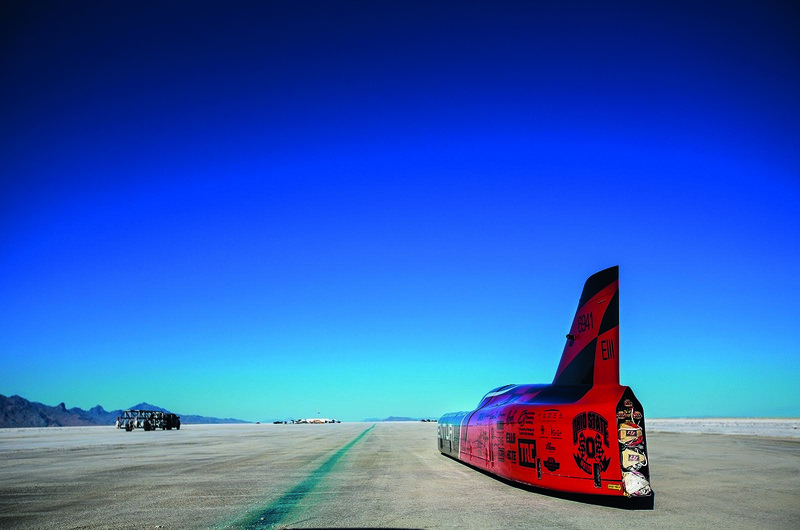 On 19 September, the Venturi Buckeye Bullet 3 (VBB-3) set an electric vehicle world speed record of 341.4mph (subject to FIA ratification) on the Bonneville Salt Flats. Perhaps more remarkable still was that the team broke its own record, set by VBB-2.5 (a battery electric version of the fuel cell-powered VBB-2), which clocked 307.6mph in 2010. The Buckeye Bullet record programme dates back to 2004, when driver Roger Schroer took Buckeye Bullet 1, which ran on nickel metal hydride batteries rather than VBB-3’s 2000 lithium ion pouch cells, to a national land speed record with a 315mph average. That year, the team enjoyed the best salt conditions seen at Bonneville for years. But since its debut at the Paris motor show in 2014, VBB-3 had been dogged by poor conditions on the deteriorating salt until a combination of dry and sunny weather, extensive surface grooming and luck – six inches of rain fell on the salt the day after the team packed for home – made this year’s record runs possible. The students, who range from high-school interns to post-graduate researchers, had used the intervening time since 2014 wisely, making numerous detail improvements to their 11.6-metre-long EV. In particular, extensive work was done in the months leading up to this year’s Bonneville trip to automate and synchronise the gearshift, which is made using a steering wheel paddle. In 2015, all runs were made either entirely in first or second gear, inherently compromising either top-end speed or low-down acceleration. This year, with a full day of test runs behind them, the team got the 3.5-tonne streamliner changing gear without upsetting its stability at the 270mph shift point. Working with suppliers such as Hewland or title sponsor Venturi, through which the custom-made electric motors and 95kWh worth of A123 Systems battery cells are sourced, is one way in which the Bullet programme helps to prepare its students for life in the car industry. Another is the opportunity to use industry-standard digital design and simulation software. And when the drivetrain components have been assembled in the workshop at OSU’s Center for Automotive Research, they are tested on rigs designed and built by the students themselves. Managerial experience, logistical planning, sponsorship sourcing, marketing the car and even conducting media interviews are all part of the project, too. No wonder graduates who have worked on the Bullets are highly sought after by employers, with multiple job offers not uncommon from car makers, race teams or the growing number of West Coast tech companies moving into the automotive arena. One graduate to have made a name for herself is Kim Stevens, who worked on the packaging and body shape of VBB-2 and is now track aerodynamicist at the Mercedes-AMG Formula 1 team. It’s unlikely that a faster twoway average speed will be achieved at Bonneville without a major improvement in the salt conditions. That’s not expected any time soon, if ever, despite the efforts of the Save the Salt Coalition to replenish the fragile surface. This year’s record was set on an 11-mile track, but Schroer reports that it was still bumpy for several miles at either end. Johanni says VBB-3 has sufficient power in its battery packs to run a 16 to 18-mile course. That’s an advantage when it comes to saving time on recharging during the pit stops between record runs (the FIA mark is a two-way average speed), but it means that considerable potential speed remains untapped. As well as options for lower gearing to improve acceleration, the team has been researching locations that might offer a longer course. Bloodhound SSC’s track in Hakskeenpan, South Africa, is unsuitable because of its dusty, lowfriction surface – not a problem for a thrust-driven, jet-rocket hybrid like Bloodhound, but not ideal for a rubber-tyred, wheel-driven streamliner like VBB-3. Instead, the OSU crew is exploring the Speed Week held on the salt flats of Lake Gairdner in South Australia as a potential alternative to Bonneville. Any overseas trip would present major challenges in logistics and cost, but based on what the Buckeye Bullet team has achieved already, you wouldn’t bet against them making it work – or setting another record.